Lawrence Lessig calls Jonathan Zittrain's book "Absolutely required reading." Cass Sunstein says it's "Absolutely essential reading." And Lawrence Tribe declares that it is "The most compelling book ever written on why a transformative technology's trajectory threatens to stifle that technology's greatest promise for society." 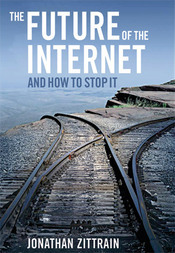 The book is The Future of the Internet--And How to Stop It. You can buy it on Amazon for $11.56, or, even better, you can download it for free from Zittrain's web site. Visit the web site, and find the PDF here. Thanks for this tip goes to Tony Yet, who guest blogged TED to China: An Inside View earlier this summer. "At first the candidate's own list of questions felt refreshing, but soon became counter-productive to the interview process. His spirit of inquiry masked an indifference to time constraints and a passive-aggressive need to dominate the conversation. As another candidate cooled his heels, the request for him to conclude his thoughts on the ideal society scarcely registered as we wondered if, then began to wish that, someone would spike his drink." I enjoy replaying this vintage gem every now and then -- Malcolm X debating at Oxford University in 1964. In this classic video, you get a good feel for Malcolm X's presence and message, not to mention the social issues that were alive during the day. You'll hear X's trademark claim that liberty can be attained by "whatever means necessary," including force, if the government won't guarantee it, and that "intelligently directed extremism" will achieve liberty far more effectively than pacifist strategies. (He's clearly alluding to Martin Luther King.) You can listen to the speech in its entirety here (Real Audio), something that is well worth doing. But I'd also encourage you to watch the dramatic closing minutes and pay some attention to the nice rhetorical slide, where X takes lines from Shakespeare's Hamlet and uses them to justify his "by whatever means necessary" position. You'd probably never expect to see Hamlet getting invoked that way, let alone Malcolm X speaking at Oxford. A wonderful set of contrasts. Why did so many find Charles Darwin's concept of natural selection so subversive and disconcerting straight from the beginning? American philosopher Daniel Dennett explains. To get to the meat of things, you might want to skip to 1:16. Crime writer Dominick Dunne passed yesterday today at 83, his death overshadowed by that of Ted Kennedy. Above, we feature Dunne remembering his rather unpleasant relationship with Frank Sinatra. It's a perverse story, though told in a somewhat humorous way. Initially, I considered featuring another video, but it's entirely too sad, especially for any parents among us. Back in 1982, Dunne's daughter, an actress, was strangled to death by her boyfriend. And, in this clip, Dunne reflects on his relationship with his daughter. A heartbreaking bit. As a side note, Dunne kept a diary during the trial of his daughter's murderer. The account was eventually published in Vanity Fair, and you can find it here, along with many other major pieces that Dunne wrote for VF. Amazingly, the murderer was convicted and served less than 4 years. Meanwhile, millions who have peddled small amounts of drugs are doing considerably more time across the US. It sounds strange. But it's very real. All money will go to charity. You can pre-order now. And although the album won't be released until October, it's already #4 on Amazon.com's sales chart. If anyone comes across some mp3s from the album, Christmas in the Heart, please send them our way. Get more details on the project here.